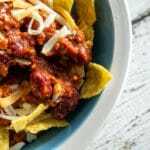 A hearty chili con carne recipe made using just one pot – easy and full of warm and delicious flavour! In a large pot, heat oil over a medium heat. Add diced garlic, onion, and red pepper; cook until onions become translucent. About 3-4 minutes. Turn heat up to high and add the beef – break it up and cook until mostly browned. Add Chili Spice Mix. Stir until beef is fully cooked through. Add remaining ingredients (except salt and pepper), and bring water to simmer. Change heat to low (you want a gentle simmer), and cook for 1-1 ½ hours, covered. Season with salt, pepper, and additional cayenne pepper (for extra spice! ), as necessary. Enjoy! If you’re unsure of which chili spice mix to use, I linked one I use often above. And in case it’s not available to you, I’ve included instructions in the post for how to make a homemade chili spice mix! It’s actually pretty easy to do. IMPORTANT! Please don’t get chili spice mix confused with ground chilli powder. That is not something you want to subject yourself to!